Alan Pardew is expecting Newcastle United’s French foreign legion to lead a St James’ Park revival from the front next season – after admitting failure last season taught him a lot about his squad. United are not expected to be busy in the transfer market this summer, with just two front-line additions likely – if they manage to hold on to pedigree players like Yohan Cabaye over the close season. 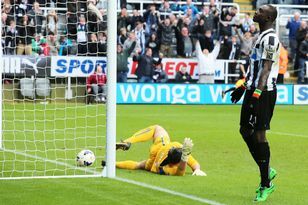 Skipper Fabricio Coloccini’s decision to stay on Tyneside for another season means any recruitment is likely to be centred on the forward-line, with Darren Bent and Loic Remy both targets. United are also understood to have another Ligue 1 striker in their sights. The limited scope of United’s recruitment may be a disappointment for Newcastle fans but Pardew believes United will be improved by the players who joined in January getting a pre-season under their collective belts. While they struggled to keep their heads above water during the relegation scrap, the United boss firmly believes that they will prove their worth during the course of next season. Newcastle’s New Year arrivals made an immediate impact in January but the contribution of Moussa Sissoko, Massadio Haidara, Mapou Yanga-Mbiwa and Youan Gouffran tailed off slightly as United’s form dipped. Mathieu Debuchy never really matched the high expectations that heralded his arrival. Pardew believes that judging them on last season would be “unfair”, however, and has told them all that he expects a vast improvement in their performances in the next campaign. Part of that will be down to better conditioning for the Premier League, but Pardew also thinks they will have got used to living in England – and will be able to speak the language much more fluently than they could when they arrived. It is something that he warned them about before they departed for the summer. “It is very natural in the heat of game or in the heat of training to stick to your natural tongue but we’re trying to knock that out of them,” Pardew (pictured left) revealed. Pardew vehemently rejected suggestions towards the end of the season that he had lost the French section of the dressing room, and has leapt to their defence again ahead of the season. He said: “I think it was a little bit unfair for us to be judged on last season in terms of the environment they came into. “We didn’t have our best players available at times and we didn’t have momentum with us and they were trying to find their feet in a division that was completely different. Pardew has already laid the law down to his squad this season and has made changes at the training ground to try and encourage improvement among his squad. “I don’t think it is a bad thing sometimes to have a season where things don’t go well. You learn a lot,” he said.